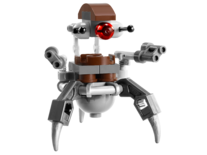 A Droideka, also known as a Destroyer Droid, is a brick-built droid, often counted as a minifigure, based on the droid of the same name in the Star Wars universe. They were not made in the usual style of minifigures, but made of many different brick elements. The first version was released in 2002. This was released in two sets, 7163 Republic Gunship and 7203 Jedi Defense I. It included eight grey battle droid arms, connecting on to the weapons and the head, and being used as the legs, and it had a dark grey battle droid body as the head. A 2x2 transparent round piece is used underneath it to hold it up and give it the appearance of the legs holding it up, which, however, they are capable of doing. The second version was released in 2007, and was only included in one set, 7662 Trade Federation MTT. This one had more large blocky pieces than the first version, and its legs were not posable, although the arms and head could fold in somewhat. The non-folding of the legs, however, made it impossible to roll. The third version was released in 2011 in 7877 Naboo Fighter. This version had folding legs, arms, and head, and could roll up into a ball. It also included a red sensor 'eye', which was the first time one of the versions had incorporated that. The fourth version was launched in 2013 in Clone Troopers vs. Droidekas Battle Pack. It is significantly smaller than the last several variants, although it retains the folding legs, arms, and head, the main difference between this version and the 2011 version being the size. A TECHNIC version of the Droideka was also released in 2000. 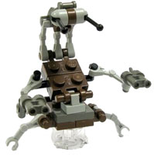 A Droideka in LEGO Star Wars III: The Clone Wars. 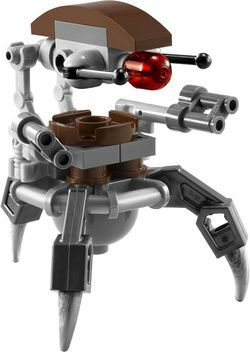 In the first three Video Games, the Droideka is based off the 2002 version, whereas in LEGO Star Wars III: The Clone Wars, it was based off the 2007 version. The droideka is invulnerable to blaster shots, but can be defeated by lightsabers. It can shoot and walk, although it normally rolls, and can only walk on console versions when the player moves the joystick slightly forward. While being used as a playable character, it is invulnerable to blaster shots, but is vulnerable while it is rolling and unfolding. It cannot grapple. Droidekas were used by the Trade Federation and later the Confederacy of Independent Systems to match their strongest enemies, including Jedi. They were used since the creation of battle droids, but were fewer in number since each had the ability to activate a shield generator and shoot rapid-fire blasts, and as a result were more expensive to manufacture. In addition to being able to deploy blaster shields and repeater blasters, droidekas were able to roll into spheres to move across the battlefield faster, at which point, droidekas were most vulnerable. Their shield generator could only be penetrated by slow moving objects, so blaster shots would be deflected back to their attackers. This page was last edited on 12 January 2016, at 22:41.